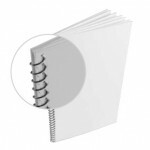 What is Spiral Binding? - ColorFX Inc.
To bind using a spiral of continuous wire or plastic looped through punched holes. Almost any material can be punched and bound, including paper, plastic and laminates. Ability to creatively interleaf pages. 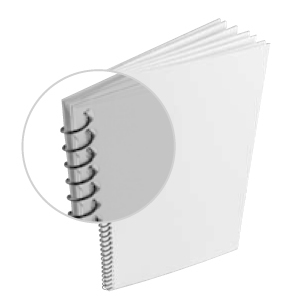 Finished piece folds over 360 degrees [useful for technical and reference applications]. Well suited for short runs. Can accommodate grain short and most paper weights. Not as sturdy as double loop wire. If the wire is crushed, it will not return to its original shape. Pages will jog when open and pages will step up when turned. Crossover designs willnot align. Wire ends are left unfinished; may snag or pull. Holes are drilled or punched. Continuous spiral wire is fed into the holes sequentially. Wire is crimped on both ends to prevent unravelling. Next What is Perfect Binding? Previous What is Side Stitch Binding?